There is nothing like a deadline to either get me panicking and/or get me moving. Sometimes this can lead to overwhelming defeat despite putting the hours in. Sometimes it can give me just the right push to work in a new way and try something a little (or a lot) out of my comfort zone. Last year I submitted two works to the Woodhorn Mining Museum open exhibition which had the welcome theme of ‘Ocean’ – something that is such an ingrained theme in my ongoing work that I had no trouble at all choosing a couple of pieces to submit. A deep shadow appears and Through the grey quiet of dawn were both selected and I was over the moon that A deep shadow appears sold even before the exhibition preview. The truth is that I much prefer painting without a deadline or ‘purpose’. My work can come together quickly or a painting can go awry many times in the creation of it. I never know how it is going to go. I plug away at each layer and more often than not I manage to draw something from the brink of being trashed but not every painting ends up being something I love. You only have to look at my studio floor to see that there are many, many works in progress temporarily abandoned until I am ready to come back to them. Each piece, however, is a lesson and I always go away with something to take into the next piece. So painting with a certain date in mind or even an imposed outcome is not my natural or preferred way to work at all. 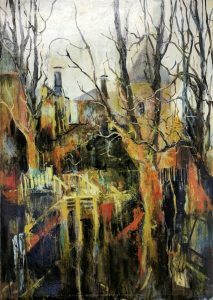 However, it is good to break out of what is natural or comfortable and when belatedly finding out that Woodhorn Museum had another Open exhibition submission date I decided to go for it even when finding out the theme was a subject matter unfamiliar to my usual work – Into the Woods. Trees – if you live in a small town, nestled in open country, of course, they are all around. But truth be told, I see what I see and closely observe only a fraction of that. I mean that in the artistic sense of course – I really think that drawing and painting help me to really ‘see’ in ways that I would not otherwise. 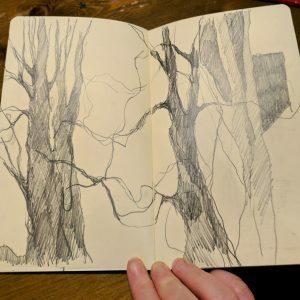 What I don’t draw and paint – well I just don’t notice in the same way. Not on a conscious level anyway. 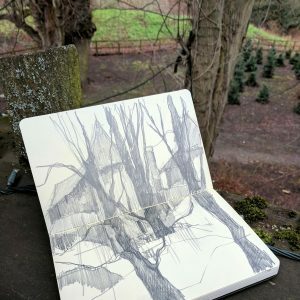 So with only three weeks to the deadline submission, on the 3rd of January, I took myself out in the freezing cold to sketch the woodland in Alnwick and again a few days later. 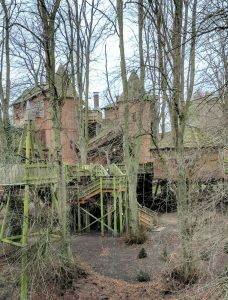 We have the most incredible treehouse down by Alnwick castle which is a restaurant and coffee shop. I thought it could be an interesting way of taking the tree theme into a more ‘me’ direction. It is rather reminiscent of a fairy tale castle with towers and fascinating shapes all built into, partially hidden and surrounded by towering trees. I can’t think I have ever drawn or painted trees much before and it turns out they are quite the challenge! It’s easy to get bogged down in detail too quickly and then another thing to know when to stop. It is winter here of course so the trees are bare and the spindly branches are infinite in their number. I am not inspired by photographic or realistic interpretation – more expression and interpretation – so when faced with hundreds and thousands of branches how many is too many? One thing I quickly realised is that for me it is about creating interesting shapes and compositions more than anything. Blocking in the biggest shapes and adding areas of space and interest around those. I have a lot to learn! Back in the studio (and with the looming deadline), I had to get to work quickly. 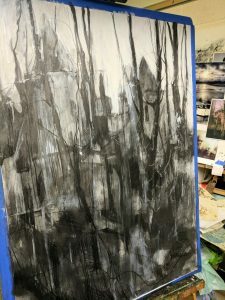 I created a large study in graphite and gesso – just to get a feel for the shapes and atmosphere I was looking for. Then quickly got to work on some paintings on board. My first intention was to work in mixed media and acrylics so that I could add layers quickly and not worry about drying time. I started one painting that has potential but I was missing the glorious rich textures of oils. I am not one to always make life easy for myself so knowing I was taking a chance on the work being ready in time I began two other paintings in oils. The first layers, colours and composition on the first oil painting were all wrong. Too blue, too blocky, too much white space at the top. I had no idea what I was doing at this stage. My temper tantrums usually come after many layers of paint but this one happened really early on. I mixed up the most hideous but glorious lime green fluid paint and just poured it over the flat painting. I knew much of this was not going to remain in the final painting but oh it feels good to just do something so unexpected that breaks me free from what is I am feeling bound by on the board. Of course, I then had to wait a couple of days for this to dry but it was a necessary move for me to make in order to find a way to move forward. See, observe, record, create, edit, express, edit some more, create, edit again, abstract, distil, create more. It’s a process that takes me months usually – so here I was pushing myself to come up with something in a ridiculously (for me) short space of time. But again, I think I need a shake-up of my art practice at the moment so the challenge is good for me right now. With only two quick sketching trips and a few decent photographs, I had very little time to get immersed in the subject and feel for what I was trying to convey and truth be told I ended up relying on my photographs much more than I was happy with – it’s all too easy to simply represent what the camera has picked up rather than the usual editing, interpretation and abstraction that I have been able to bring to my paintings more recently. I think with the maritime work because I have been so immersed in it for so long – I can take it in a direction that goes beyond representation into more of a ‘feeling’ or an evocative sense of what I am trying to convey. But here with the woodland and trees, I was relying much more on what I had seen and photographed. Four and a bit sketches were not quite enough for me to go beyond that – but it’s all part of the process. 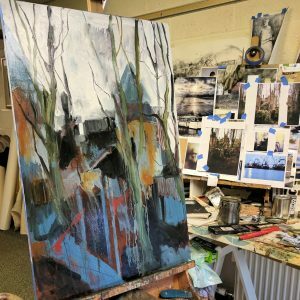 The next stage was the one where things began to make sense – the colour palette came together pretty quickly, more shapes were added to alter the composition and bring things a little higher on the board, many, many layers of thicker oil paint mixed with a little cold wax were added. The cold wax beefs up the paint a little and helps it dry a little faster too – much needed with the date for submission drawing close! 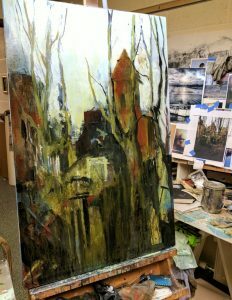 The final layers were about adding shapes and details, obliterating them over and over, drawing them back out and changing the values with more fluid paint and glazing. Then adding branches and wondering how far to go with this – it could be a never-ending process. 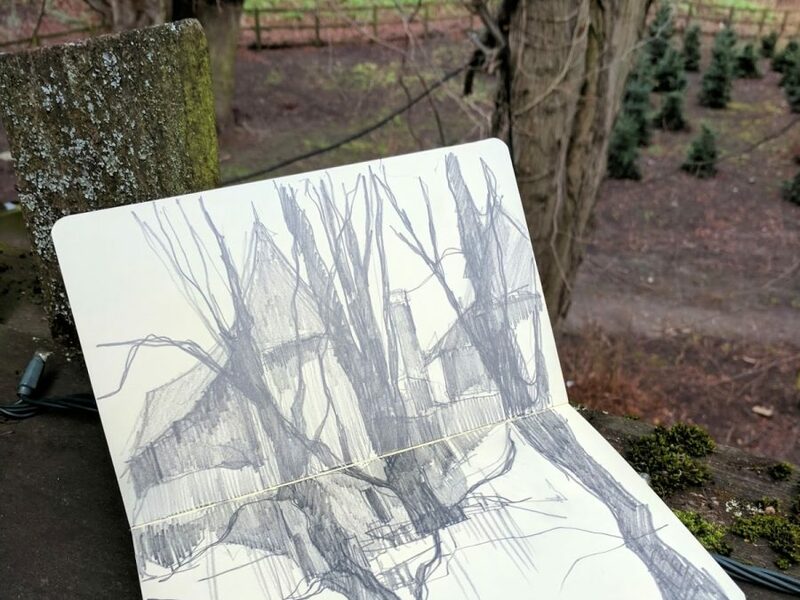 I also lightened the values of the towers in order to push those back a bit – and added lots of colour and texture to the trees to hopefully bring them forward. The structure of the treehouse really is fascinating in the way it lends itself to abstract shapes around the trees – there are a lot of verticals of course with the support of the trees and the trees themselves and given more time I would have loved to explore more variation in direction and shape but I shall leave that for another time. Am I happy with the finished painting? Hmmm – it feels like a beginning of something but I have a great deal more learning and exploration to do. A process to find my own way into the subject and atmosphere that would make it more personal to me. It feels too representative of the photos I took and even now looking at my sketches again I can see things that I can approach differently in the next paintings. But I did love exploring the textures of paint in particular in order to build up a rich surface. It’s all about process, right! I have been feeling for a little while that I need to take a break from my ongoing maritime series in order to gain a fresh perspective and a way forward with it. I have ideas of how I want to do this but it all needs a little time. This could be a fascinating respite so I think I will be exploring more ‘into the woods’ for a little while. Sketching date scheduled in my diary for tomorrow! PS – Two paintings finished and framed by the skin of my teeth for the exhibition submission. Note to self – buy my framer a box of chocolates for his endless patience and miraculous ability to frame still-wet paintings. 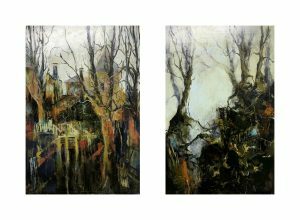 All delivered on time for the Woodhorn Mining Museum deadline and accepted for the Into the Woods open exhibition which opens on 16th February and runs till 22nd April 2019. Incredible description of your process and frustrations, surprises and learning involved in this series. Was the fluid paint oil or acrylic? Wish I were a fly in your wall during this….suppose this is close! Thank you so much Gail! 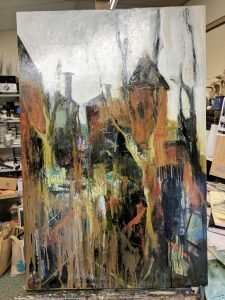 The paint was fluid oil – lots of medium and spirits added to make a fluid paint that I could throw over the board. I am so glad you enjoyed reading it and thank you for commenting! Your art blows me away. I love and enjoy every thing you do. Gosh Nina thank you so much – that is a lovely thing to hear! Thank you for writing this. 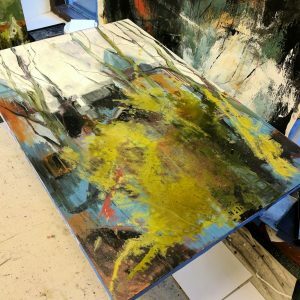 It helps so much to read the process and “head talk” of an artist creating a new painting. Techniques are great to learn but thought processes are absolute gems for me. Loving the woodlands theme. Have a great day sketching. Jennie thank you so much! That is such a thoughtful comment and it really helps me know that my writing helps other artists in some small way. Thank you so much for that wonderful encouragement! It means a lot. Fascinating to hear about your process. Thanks for sharing, love the outcome, which was totally unexpected, darkly passionate. Mary thank you so much!! I love your description – ‘darkly passionate’. Love that you see that in this works!! Dear Gillian, this was so fun and exciting to read, like an art thriller! 😉 So great to read about your process, thoughts and struggles. I LOVE your (still wet) finished works a lot, and your drawings in the sketchbook also. Sandra thank you so much! Haha an art thriller – I like that! Thank you so much for your lovely comments. Very interesting works of art. I do not understand anything about art but I like your works. Best of all your drawings. Beside your art work I like your writing. If one just listens to you one can see your works. It is a very special way of description and very lively too. I believe that it would be interesting if exposed works would also have a description of works for blind people, which they could take home with. People also see with the heart and soul. Thank you for sharing. Gerda thank you so much for your lovely comment. Yes it is always surprising to me how much my writing and reflection is intertwined with the actual physical creation of my art. I agree – words can bring so much understanding and in a visual world, braille or audio descriptions of art would bring so much inclusivity to the art world. Well what a revelation. We visited the Woodhorn exhibition today. Me for the second time as I was there for the preview. I had a weeny painting entitled Winter Moon accepted into the exhibition which I was thrilled about and went up again today with some friends to have a quieter look. We admired your wonderful paintings and OMG now I’ve just been reading all about your creation process here. Totally fascinating. Thank you. Thank you so much Anne – I popped you a quick email. Congrats on getting into Woodhorn – it is a fabulous exhibition! So glad you enjoyed reading these posts – and thanks for connecting with me here!